WoW! This is so beautifully designed! This will definitely be going in the featured list. I haven't installed WA3 since my XP install, guess I'll be doing that now. This is a really excellent looking skin!!!!! Looks well organized and the graphics are great. Niceeee work eh!! ...Hope fully i get a skin like this for Windows media player!.. Very Nice Skin. But the only problem is that i shows as the defalt skin. i was wondering if you could make it in a XP blue for me? cool but i have hard time with instaling it in winamp any help??? I'm afraid this crashes my winamp (3.0d) when I select it... A shame because it looks hot! Where do i extrack this file? Just to try to help out with the install. 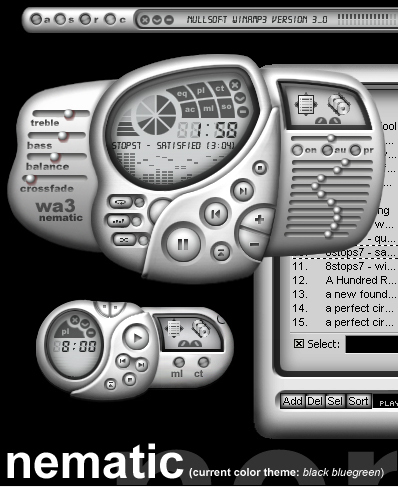 Just take the zip file and put it in the skins directory of Winamp 3. You dont have to open it and extract anything. Wow.. what a beautiful and creative player. Good work. My only critique is that the slim style is a bit like every other slim style I've seen. The other two modes are genious though. Very stylish, i love it. Fabolou$ : havent tried skinning wmp yet...maybe i'll try it in the future. AHHHHHH! I love this Skin soooooooo much!!!!!!! even though it doesn't work, i just love it hahahahaha LoL, maybe its cuz I'm still running windows 3.1 thats why is not working, ohh welll I still love this skin!! !